Do you currently use Enterprise Project Management software? Less than 15 percent of enterprise companies measure the business outcomes of their project initiatives, according to a recent study by Gartner. This leads to unproductive projects that waste company resources, in addition to a lack of progress on business objectives. Enterprise project management software provides companies with the tools needed to efficiently manage all of a company’s projects at an enterprise level. This involves viewing projects from a strategic perspective, allowing executives to prioritize projects and delegate resources, and determining how different projects fit into company objectives. Vendors who offer EPM solutions focus on streamlining all related projects for maximum effectiveness. To accomplish this, successful EPM systems provide first and foremost project portfolio management (PPM) modules, in addition to file sharing, internal messaging, calendars, and more. In this guide, we will detail features commonly found in EPM solutions and discuss how these features can contribute to your strategic business goals. Project portfolio management is the primary feature in enterprise project management software. PPM modules centralize management processes to determine the optimal schedule and allocation of resources to achieve an organization’s operational and financial goals. As your organization continues to undertake more projects, being able to centralize and successfully balance projects is the key to overall organizational success. In fact, of the organizations that described themselves as highly effective in portfolio management, 62 percent met or exceeded expected ROI. Companies who effectively utilize PPM systems are constantly interacting with the modules. The majority of portfolio managers in highly effective organizations spend 75 percent or more of their time on portfolio management systems. While these systems offer the tools needed for organizations to be successful, they require consistent upkeep to remain viable. How are people using PPM? A wide variety of organizations are utilizing project portfolio management tools. In a survey performed by Daptiv, around 64 percent of respondents reported using PPM tools to manage general IT projects, while the remaining 36 percent deployed PPM solutions for compliance, product development, training, and other related projects. In the same study from Daptiv, respondents identified the top reasons for PPM use to be (in order) prioritizing projects, gaining visibility into live projects, planning and preparing for future projects, and managing costs and resources. While some of the reasons for implementing a PPM solution may be more prevalent than others, most organizations utilizing PPM software (62 percent) claim to use their system for all of the above reasons. According to a study from the Aberdeen Group, organizations that utilize a PPM tool are 44 percent more likely to complete projects on time or early, 38 percent more likely to complete projects on-budget, and 52 percent more likely to hit the expected ROI. Additionally, a study from Forrester Research Group concluded that implementing a PPM solution produced an expected ROI of 255 percent. The success of any project portfolio management solution is dependent upon understanding how the system is best utilized for your business objectives. PPM software typically includes five key management capabilities. Pipeline management provides the overarching vision that helps managers decide whether a project or set of projects in the portfolio can be completed by a company with limited resources, in a specified period of time. By constantly providing project insight based off your organizational plan, you can determine which projects advance business objectives, and find the best way to allocate organizational time for maximum efficiency. Which Enterprise Management software is right for your business? Resource distribution enables you to efficiently allocate company resources to projects based on comparative time-frame analysis. By keeping inventory records on your PPM software, you can utilize resource management to make more informed allocation decisions. Resources that can be managed from your PPM solution include include financial, inventory, and technical skills, along with human resources. In addition to offering resource allocation on an individual project basis, some PPM systems allow users to model ‘what-if’ scenarios, and extend this view across the entire portfolio. PPM systems are designed to increase the likelihood of project success, including the ability to shift gears mid-project without going over budget or past due. Change control allows you to constantly keep updated with fluctuations in project details, including new requirements or features, operational constraints, regulatory demands, and technical alterations. From your PPMs central repository of resources, you can quickly assess change requests and match available resources to overall demand. Additionally, change control allows you to reassess project timeline and budget in real time. Within the PPM, your financial manager can more accurately estimate and manage the financial resources and anticipated outcome from a project or collection of projects. Most PPMs are capable of demonstrating the anticipated financial value of projects in relation to strategic objectives and organizational priorities. In addition, financial administration capabilities let users see updated financial progress in real time, allowing you to more accurately determine if a project will fail to meet financial objectives before project completion. If you are able to determine that a project or group of projects will not meet the expected financial outcomes, you can cease investment before incurring additional losses, or change the parameters. By evaluating the risk present in each existing and potential project, you can use risk regulation to determine confidence levels across the portfolio. By grouping projects, you can assess confidence levels on a categorical basis, and assist financial and resource allocation decisions. The results from risk regulation allow you to determine which projects present too high of a risk, or even which facets of individual projects present the most risk. You can then determine how to increase their confidence. Using risk regulation modules prior to launching a project can help your organization avoid poor investments. While project portfolio management is the centerpiece of enterprise project management software, most vendors offer additional features to increase organizational effectiveness and efficiency. These features are integral to successful EPM implementation. File sharing capabilities let users upload and share files directly from the EPM software. All team members with access to projects can view and sometimes edit pertinent files, streamlining the transfer of information. 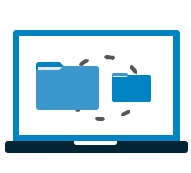 More innovative file sharing modules include advanced permission settings and audit trails to keep sensitive information secure and organized. File sharing can be a significant factor for companies deciding between cloud-based and on-premise EPM solutions. With cloud-based solutions, file sharing can extend to mobile devices without location-based limitations. Some organizations feel that information stored on the cloud isn’t secure and would rather have all company files stored on-premise. While potentially more secure, that usually limits the file sharing capabilities of their EPM solution. Most projects require the efforts of multiple departments to be successful. Internal messaging lets individual team members or departments communicate with one another directly through the EPM system, increasing project collaboration and task efficiency. Currently, few systems offer video conferencing capabilities as a part of their enterprise project management software. It’s a feature that many companies desire in their EPM solution, but can also be found through third party collaboration vendors. For example, some companies currently use Skype as a supplement to their EPM system. Regardless, some vendors do offer internal video conferencing, which can be useful for remote communication, but is typically more expensive than internal messaging or note-taking modules. Some EPM systems have a projects calendar that includes a monthly view of all active projects as well as project deliverables. Calendar modules vary in complexity from system to system, from simple due dates and project maps to temporal resource assignment, progress completion, and task individualization. Some enterprise project management solutions let administrative users create individual calendars for team members. By removing unnecessary information from team member’ calendars, they can easily see upcoming tasks and due dates. Customizable dashboards in EPM software allow you to quickly analyze critical project information. Many EPM systems allow you to filter out unnecessary information for easy access to the most important data. Dashboards can be as simple as a breakdown of resource availability or as complex as project value analysis. Many vendors – especially vendors with cloud-based EPM systems – offer mobile access or applications. This allows team members to update project information, such as resource changes, from any locations. For example, your customer may send you an email after hours asking for addition materials for a certain project. By quickly accessing and updating resource requirements, you can verify material availability while avoiding overbooking or overselling. Enterprise project management vendors offer a variety of integrations that can increase accuracy and efficiency. A few of the more common integrations include Dropbox, Skype, and Microsoft Office. Other EPM software can integrate with advanced business platforms such as Salesforce or other CRMs. This lets users attach pertinent contact information to projects, or update lead files. Additionally, many systems include internal upgrades or integrations, such as Oracle’s PPM software which integrates with other Oracle Primavera products. These types of solutions usually cost extra, but can be worth the investment for the increased efficiency and ease-of-use. When companies are investing in a system that houses much of their financial and strategic information, security is a huge concern. All systems include some level of security, be that file encryption or profile authentication. For companies with especially sensitive information, some EPM solutions include additional security measures such as external data centers and data recovery/backup. Increased security can sometimes correlate to a decrease in access for certain team members. When searching for an EPM system, it’s important to find the right balance between accessibility and security for your projects. 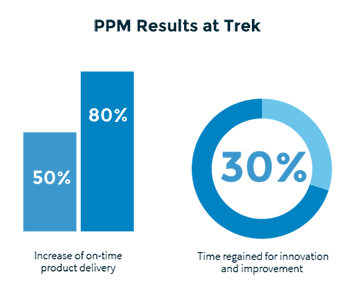 Trek, a major bicycle and cycling product manufacturer, was seeking an enterprise project management solution for their global team. After investing in AtTask EPM, Trek was able to visibly align its team to avoid project pitfalls, increase productivity, and gain a strategic advantage in the competitive bicycle manufacturing industry. This increase in efficiency was exemplified in the noticeable increase of on-time product delivery from 50 percent before AtTask to an impressive 80 percent after implementation. Additionally, Trek utilized AtTask to regain 30 percent of its time for innovation and improvement.